Masking fluid is a liquid latex-based product that is very effective at keeping small areas and thin lines white when painting on watercolour paper. The latex prevents the paint from reaching the paper and is peeled off to expose the untouched white paper underneath. Masking fluid can be applied in many ways with a variety of tools. If you’re using a brush make sure it’s an inexpensive one that you can spare. This is because the latex might not come out completely after use. Make sure you keep your brush clean by washing with soap or washing up liquid and warm water. Masking fluids come in a variety of tints so that you can see where you have painted it. Your paper must be dry when you apply it. Gum Arabic is made of hardened sap extracted from 2 species of the Acacia tree. It’s used to bind pigment in watercolour manufacturing processes. Gum Arabic dissolves very easily in water, and is used as the binder in watercolour because it also effectively binds the pigment to the paper surface once the water has evaporated. Gum Arabic allows for more precise control over watercolour washes as it limits the amount of flow and/or bleed of the colour. Gum Arabic also allows the evaporation rate of water, which means that it keeps your watercolour wet for longer, allowing for longer working times. Once water has evaporated from watercolour, the colour’s luminosity and transparency, as well as permanence, is enhanced by the gum Arabic. Schmincke AQUA Shine and Winsor & Newton Iridescent Medium are both pearlescent watercolour mediums that add a shimmer effect to your colours. They can also be applied to work pure. Both Aqua Shine and Iridescent Medium retard drying and stay watersoluble. Ox Gall is made of the gall from cows and is mixed with alcohol. I’is a natural wetting agent for the degreasing of undercoats, allowing for greater adhesion onto already dried layers of watercolour paint. Ox Gall can also be used in gouache painting. Used sparingly, ox gall can also be used as a watercolour levelling agent. When granulation medium is mixed with watercolour paint it gives it a mottled appearance as opposed to an ordinary smooth wash. Some colours naturally have a mottled or granulated appearance, such as French Ultramarine. Granulation medium increases this characteristic in such pigments. Schmincke AQUA Fix is a varnish that can be applied at any stage during the watercolour painting process to protect work that has already been completed. Once the varnish has been applied the paint underneath cannot be reworked. AQUA Fix can also be used as a picture varnish on finished works to help maintain lightfastness and protect the work from dust or dirt. 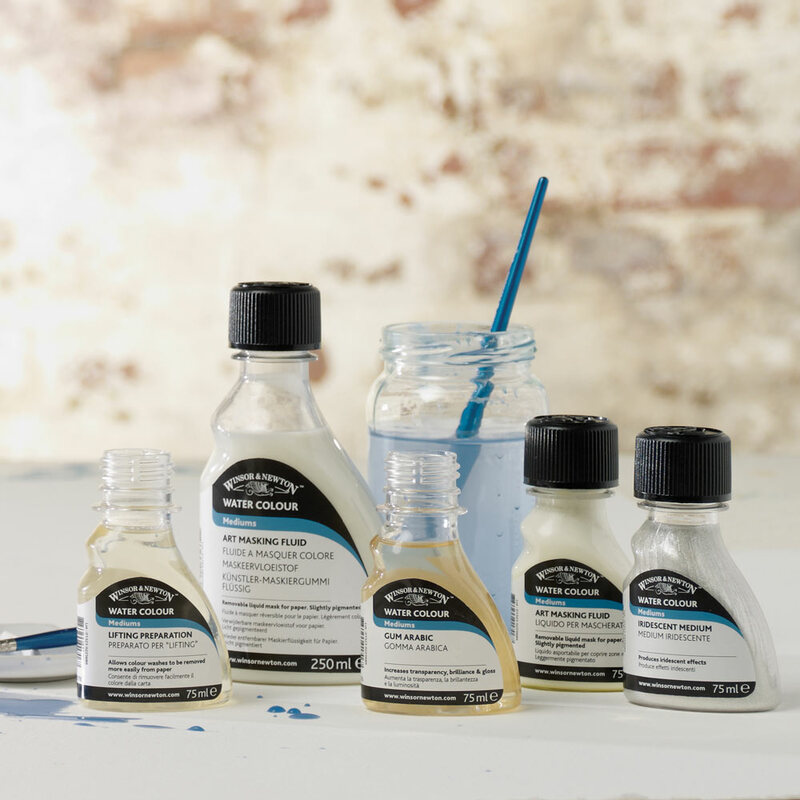 Schmincke AQUA Gloss increases the sheen and brilliance of watercolour paintings. It also retards drying and remains water-soluble after drying like a water-colour. It can mixed with watercolours or applied pure. Save up to 45% on our extensive range of Watercolour Mediums in-store & online! Ends 29/04/18.